I know I gush about everything I post, but this was seriously so, so, so good! I wouldn't say that cauliflower is my favorite vegetable (or even close to the top of the list) but this curried cauliflower... I could eat it for a snack. Or for dessert. Yes, my friends, I might choose this cauliflower over a cookie. (Cookies and I seem to be on the outs lately... how sad for me.) And the chicken piccata... I know it's not authentic, but it is so delicious! Geoff thinks it tastes more like German schnitzel, and I kind of agree. 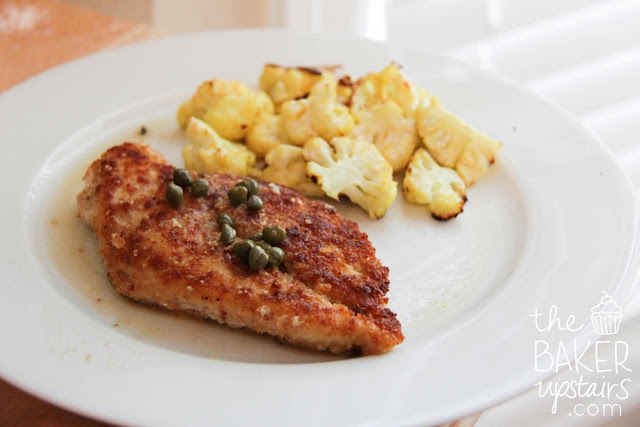 But I'm going to continue to call it chicken piccata so I can put those quirky little capers on top. It was one of those dinners that came together really quickly (like, 25 minutes) and was super easy, but tasted like something I would order at a restaurant. So pretty much perfect, as far as I'm concerned. I seriously want to eat this meal at least once a week. Yum! Cut chicken into 4 cutlets, then place cutlets between 2 sheets of parchment paper or plastic wrap and pound out to 1/4-inch thick. Sprinkle both sides with salt and pepper. In a shallow plate, beat the egg whites and 1 teaspoon of water together. Place the bread crumbs in another plate. Dip each chicken breast first in the egg, then bread crumbs. Heat a large saute pan over medium to medium-low heat. Spray a generous amount of olive oil spray on one side of the chicken, and lay it in the pan, oil side down. Spray the top of the chicken generously to coat and cook for 2-3 minutes on each side, until cooked through. Set aside until you make the sauce. For the sauce, clean the saute pan. Over medium heat, melt butter, add the lemon juice, wine, chicken broth and the reserved lemon halves, salt, and pepper. Boil over high heat until reduced in half, about 2 minutes. Discard the lemon halves, add the capers and serve one chicken cutlet on each plate. Spoon on the sauce and serve with a slice of lemon and a sprinkling of fresh parsley. Wash and core the cauliflower and cut the florets into bite-size pieces. Place in a large bowl. Toss the cauliflower with the olive oil, salt and curry powder. Turn out the cauliflower onto a large rimmed baking sheet. Bake for 16-18 minutes, stirring every 6-7 minutes, until the cauliflower is browned in spots and is crisp-tender. Serve immediately.